Where reception now sits, there was once a lift shaft. As there was no space to speak of in front of the lift, the receptionist in the old days had to stand in front of the lift, which was curtained off, to greet guests. We found someone prepared to remove the lift for free, in return for all the scrap metal. Behind the old hospital lift we found two arches. One had collapsed in on itself and needed to be rebuilt by our stonemason Oliver. The other was intact. 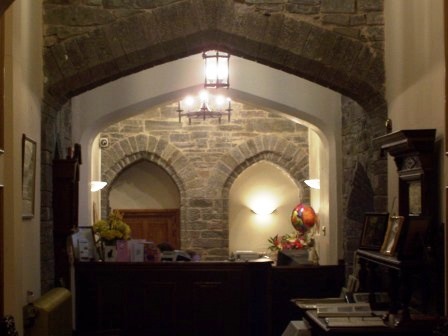 We now know these would have been individual doorways down to the twp cellar kitchens, one for each of the two Morgan Morgan families living in the castle in 1876. 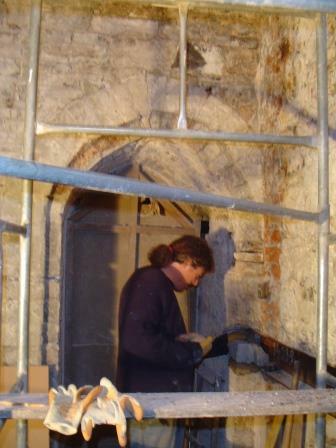 We understand each had their own kitchen in the cellars and their own doorway entrance to 'their' kitchen.